September 26, 2016 By This post may contain affiliate links. Make cute and quirky Chocolate Caramel Pretzel Monsters for Halloween. They are quick and easy to create using a variety of candies and are perfect treats for this fun holiday. 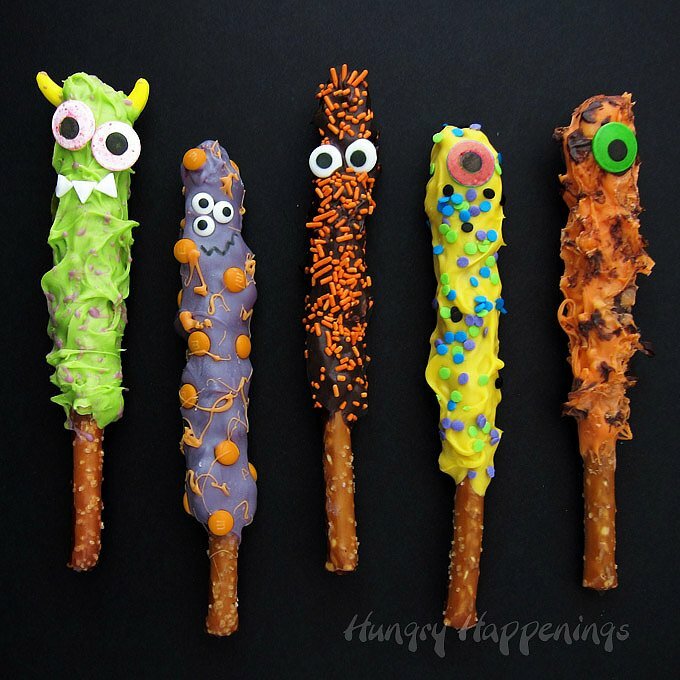 If you need a simple treat to make for Halloween, you’ve got to try these pretzel monsters. They are lumpy and bumpy and furry and fun. Plus they taste great. You start with a pretzel and cover it in caramel (or you can use peanut butter, chocolate hazelnut spread, or cookie spread) then roll it in chopped nuts or toffee bits (or some other toppings that will help make your monsters look lumpy and bumpy). Then you’ll dip the pretzels in a variety of colored candy melts and go to town decorating them with candy. You can make all your monsters look exactly the same or completely different. Grab any candies you have in your pantry. Mini M&M’s, confetti sprinkles, and jimmies work great. You’ll also need some candy eyes. You can use any size candy eyes or draw some pupils on regular sized M&M’s or Smarties. You can watch the video below to see how I made two of the pretzel monsters, but there is no right or wrong way to make these monsters. Just be creative and have fun. Pretzels covered in caramel and colored Candy Melts decorated with candies to look like monsters. Pour caramel bits into a microwave safe bowl. Heat on medium power for 30 seconds. Heat on medium power for 20 seconds. Let sit in microwave for 2 minutes. If needed, heat for 10 second increments, stirring after each until melted. Note: Don't allow the caramel to get too hot because it will harden like hard candy. You just want to warm it until it's spreadable. Spread caramel over three quarters of a pretzel. Immediately roll caramel coated pretzel in chopped nuts or toffee bits. Repeat, with 5 more pretzels. Freeze pretzels for 5 minutes. Spoon candy melts over caramel coated pretzel. Immediately decorate using candy eyes, candies and sprinkles. Freeze for 3 minutes until candy coating hardens. Allow pretzels to sit at room temperature for a while before adding details with food coloring markers and then packaging. 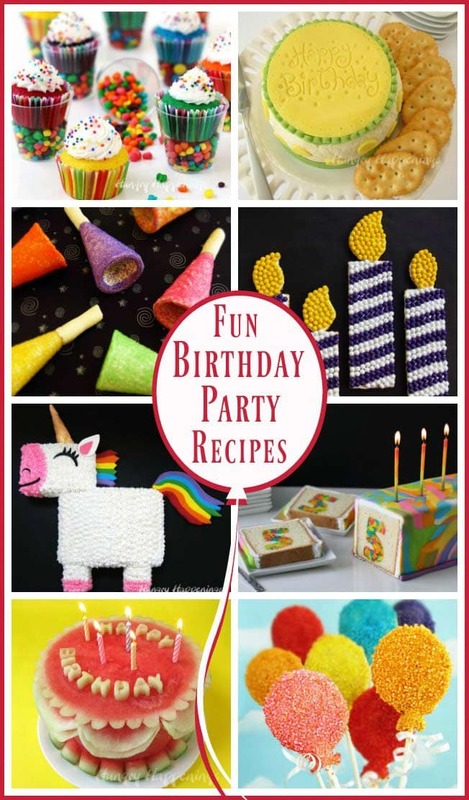 Hungry Happenings has created some festive recipes for any birthday party that any girl or boy will love. Thanks, Karen. When I was designing these treats, I definitely wanted them to have texture and lots of bumps! The nuts and toffee bits work perfectly plus they taste great. well you did it again. another great idea. 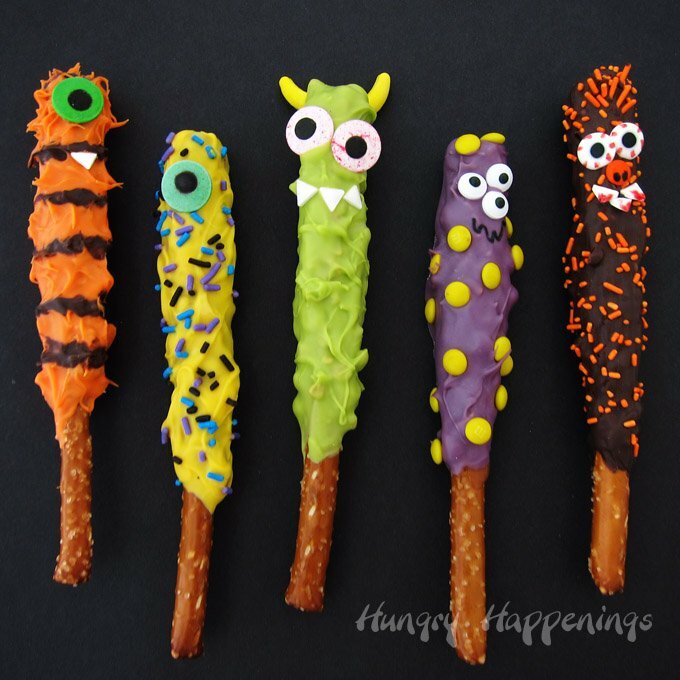 I’m going to make some of these pretzel monsters for a Halloween party that I’m going to. can’t wait to see what else you come up with. Eek! 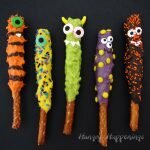 I’m so happy to hear that you will make these pretzel monsters for your Halloween party. I always love knowing I’ve inspired a reader to make a cute treat to make their party really fun. Enjoy! I like my monsters cute so these are the monsters for me!! Me too! Although, having hosted 10 Halloween parties, I am getting used to the creepy monsters too. These are the cutest monsters, and virtually mistake proof. I work with special needs individuals and always on the lookout for a fun adaptable ‘cooking’ adventure. They’ll have great fun creating these for the Halloween party. My name is Bin-Na Baek an editor with Wizkeys—a South Korean magazine for teens. I am sending this e-mail to ask if we can carry the photograph of your ‘Chocolate caramel pretzel monsters’ on our magazine. In Wizkeys, there is an article that introduces interesting cooking every month! So, I was hoping to show that to our young readers! Also, I ask you whether I can receive better picture quality than that on the homepage. If it is possible or you have any question, I would greatly appreciate it if you can reply to my e-mail. Yes you may use an image from the post for your magazine! Thanks.